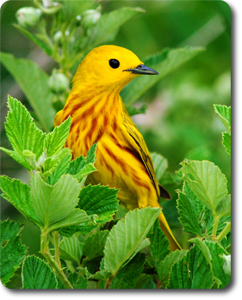 "Happy Yellow Beauty" The Yellow Warbler is one of America's most treasured Wood Warblers and their song "Sweet Sweet Sweet I'm So Sweet" makes the sunny spring days seem even brighter when you hear it ring out across the meadow. This lovely Proud fella was captured at Blue Grass Fish and Wildlife Area near Evansville, Indiana. Yellow Warblers love nesting near ponds and streams that have a lot of Willow Trees and they can sure brighten up a Blackberry Bush in a hurry just like He is doing in this shot.